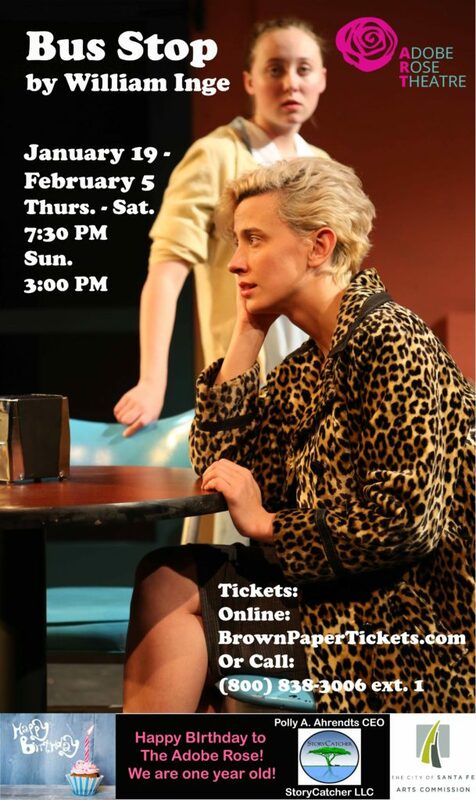 From The Dramatists Play Service, Bus Stop tells the story of chance companions, passengers on a bus out of Kansas City, unexpectedly stranded together in a roadside diner by a howling snowstorm. All roads are blocked, and the weary travelers are going to have to hole up until morning. Cherie, a nightclub chanteuse in a sparkling gown and a seedy fur-trimmed jacket, is pursued, made love to and finally kidnapped by a twenty-one-year-old cowboy with a ranch of his own and the romantic methods of an unusually headstrong bull. Even as she's ducking out from under his clumsy but confident embraces, she muses, "Somehow deep inside of me I got a funny feeling I'm gonna end up in Montana." As a counterpoint to the main romance, the proprietor of the cafe and the bus driver at last find time to develop a friendship of their own; a middle-aged scholar comes to terms with himself; and a young girl who works in the cafe also gets her first taste of romance. In his comedy, Inge paints the snowstorm and the apparent turmoil in each characters life as a grand adventure, full of hope and possibility. When we lose our way in a trackless landscape, the best is that the world becomes white again without well-worn paths or stale choices. Where anything can happen, and the company of strangers becomes nearer than that of our familiar lives before. Written in 1955, Bus Stop was Inge's greatest triumph. Harold Clurman directed the Broadway production, to enormous success. "Mr. Inge has put together an uproarious comedy that never strays from the truth." - NY Times "William Inge should be a great comfort to all of us he brings to the theatre a kind of warm-hearted compassion, creative vigor, freshness of approach and appreciation of average humanity that can be wonderfully touching and stimulating." - NY Post "Bus Stop is especially rich with possibilities. It can be very funny. It discovers the fresh and the particular within characters who can too easily be seen as archetypes of humdrum Americana. It's also constructed with an innate sense of a form that works well in popular theater." -NY Times Staci Robbins ("Opus"; "Lobby Hero") directs Bus Stop. The play stars Todd Anderson* as Carl, Melissa Chambers as Grace, Jessica Haring as Cherie, Kent Kirkpatrick* as Dr. Lyman, Ruben Muller as Will, Tyler Nunez as Bo,Marika Sayers as Elma, and John Warner Widell (better known to Santa Feans as Johny Broomdust) as Virgil. January 19 - February 5, 2017 Thursday-Saturday 7:30pm Sunday Matinee 3pm *Member of Actors Equity Association - the Union for Actors and Stage Managers.